6pm – 7.30pm AcroYoga foundations – ideal for complete beginners to get a taste and everyone else to warm up and hone the basics. 7.30pm – 8.30pm AcroYoga Jam – freestyle acroyoga play. Practice and experiment in a supportive group. During the glorious summer months, if the weather is good, the session will often be held on the grass just outside the hall. Please contact us or visit the Facebook group to check it’s on before you travel to a session! We also use the group to organise other jams. 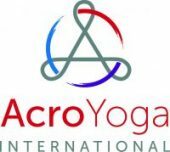 Connect with Carmarthen Acroyogi’s and the latest news on the Carmarthen Acroyoga Facebook group – also a good place to check if we are running any workshops or classes in the area.